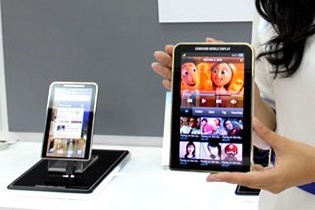 Galaxy tab 7.7 is a second generation 7-inch tablet from Samsung that was earlier rumoured to be released by second or third quarter of this year. Now the same is all set to be announced at IFA conference to be held in Berlin shortly. A new Android application, Samsung’s Unpacked application is also to be announced which will be made available after 1st of September along with Galaxy 7.7, the galaxy tab 10.1 and Galaxy tab 8.9 which are also waiting in the market may be announced too. The Galaxy tab 7.7 might be powered by Honeycomb platform along with the other two. Some of the specifications included may be a 1.2GHz Exynos processor, 1GB RAM and 16GB SSD. Well it will be better if we present all the specifications after the announcement. So we suggest you wait for a little longer as the conference starts from 2nd of September.